I still remember that my father often brought some cakes back home after work, saying those cakes were redeemed from gift cards given by friends. Inside the beautiful box, there were dozen of assorted cakes. Among them, there was always a piece of walnut butter cake that was my favourite. My four other siblings also liked it very much. How could a piece of cake be enough for the whole family? This question always came up in my mind: why not all of them were walnut butter cakes? Now, I don't have this problem at all, as I’d bake a walnut butter cake, big enough for the whole family. Not only can everybody have one piece, but also as many as they want. Preheat oven to 180C (356F). Cream the butter and sugar with an electric mixer over medium speed until the mixture is smooth, fluffy and light in color (see picture 1). Whisk eggs. Stir in one-third of the egg into the butter mixture at a time. Stir and combine well between adding egg each time. Sift flour into the egg mixture. Use a spatula to combine all ingredients. Make sure to scrape the sides of the bowl and mix well (see picture 2). 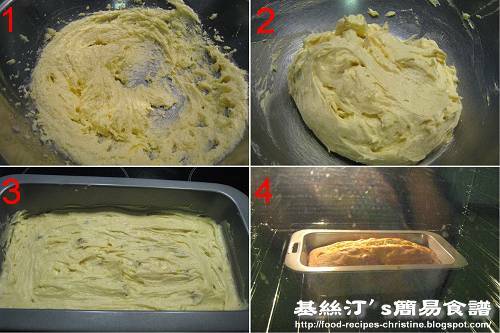 Grease sides of a rectangular cake mould, 11cmx21cmx6cm, or use a non-stick one to skip this step. At last, incorporate walnuts into batter. Transfer batter into mould. Bake for 35 to 40 minutes (see picture 4). Test with a needle. If it comes out clean, it’s done. Let cool on wire rack. I have flour and butter. I wish I had walnut to use up for this recipe.... hehe. I love a little texture in my pound cake. Walnuts are a good call. 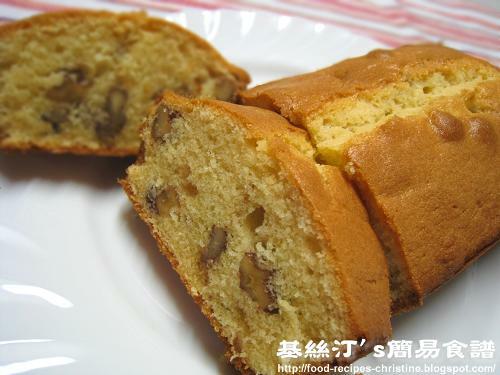 I love the addition of walnuts in this delicious pound cake! Mmm...So good if can add some raisins into it. Christine, thanks for following my blog. :-) I have subscribed your recipes! I am bookmarking this butter pound cake! Definitely try it! That's good. How long would they stay with you then? wonderful pound cake, looks incredibly moist and soft yum! I'll bet your family is very happy that you now bake your own version of this cake! Such a lovely bake! Walnut always a good ingredient in bakery and yours looks great. Cheers. Pound cake + walnuts, does it get any better. This looks spectacular and a great gift for many of my non-baking friends. Thanks for the ideas and inspiration. This sounds like a wonderful cake, and I love walnuts! Christine: If I don't have self-raising flour, can I use regular flour and add yeast? How much yeast should I add? Melted butter?? Do you mean room temperature butter!??? to cream with sugar? You could mix 1 teaspoon of baking powder into plain flour, add a pinch of salt would be good as well. Butter softened at room temperature. "Cream the butter" means to beat the butter with an electric mixer until it turns like cream and fluffy. How can it make the cake more rich and dense (not light and soft)? Do I use plain flour instead? Thanks, still loving your recipe!! You might add a bit extra butter/oil more than the recipe calls for. Once the cake is cooked, remove it from the oven. The longer you leave the cake in the oven, the drier the cake will be. Just made this today! It turned out very well and tastes really nice:) thanks for sharing this recipe!!! Just made it today. It smells more like 紙包蛋糕, and the texture is not firm like the ones I tried in Hong Kong bakeries. I have to confess that I used bread flour Instead and added 1 1/2 teaspoons of baking powder and a 1/2 teaspoon of salt to make the flour self rising (got it from the Internet, because I did not have self rising flour). Could that be the problem? Thanks Christine for sharing your recipes which have so far been successful! Different types of flour will make products with different textures. You can use plain flour/all-purpose flour and mix with baking powder and salt to replace self-raising flour. I used unsalted butter for making cakes and desserts.